I want to keep this one short. I’m also thinking I might change these to bi-weekly reports since there likely won’t be a lot to say every week (unless the masses demand otherwise). I did want to mention a few points though. 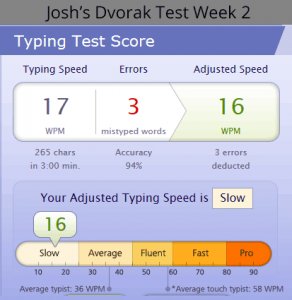 As the screen capture indicates, I increased my typing in Dvorak speed to around 16-17 wpm over the last week. And this was through 15-30 minutes a day of intentional practice. I found a new site that I will recommend for typing practice of all kinds. I can’t really find a name other than the url, which is keybr.com. The site description suggests you can “Learn typing at the speed of thought!” I don’t know about that, but it does do a nice job of starting you out with typing lessons that focus on the most commonly used letters–which is great for learning how to type on a Dvorak layout–and keeps track of the letters you’re having trouble with to incorporate them more regularly. You can even change the layout graphic to help when you get stumped. I expect that my typing test speed will improve even more than fifty percent over the next week if I can manage to start practicing more letters. There are settings you can change if you don’t want to follow what it gives you exactly. The other thing that I wanted to mention is that I took a little trip to doubt city on the experiment this week. Mostly, this was because I started reading about someone else’s attempt to learn Dvorak and how they thought it was a waste of time. It made me second-guess myself and run down the rabbit hole of research for a little while. And this was generally unhelpful research, just looking at a lot of opinions. It was a bummer and reminded me of all the other times I thought of some strange scheme to improve whatever. Those were all largely failures. Eventually, I stopped thinking about whether or not it would be worth it. I remembered that it was a fun experiment and that I’ve already learned some stuff about myself. It might still be a failure, of course, but I at least feel better about the ride.